Infrastructure asset management is evolving. In the early days, paper-based parity contracts regulated utility pole installations, use, and maintenance between the telephone and power companies. In contrast, today’s overcrowded poles demand lengthy legal documents and regulatory oversight, while new attachers and emerging technologies apply constant pressure for greater speed to market and fewer barriers to entry. Today’s asset owners are struggling to keep up with billing, maintenance, and work requests as the rate of change continues to speed up. With the advent of the Internet of Things (IoT), the challenge for infrastructure asset management is to look beyond the immediate struggles of today to envision the potential growth that these developing advancements offer—and to address the changing needs and considerations that they create. 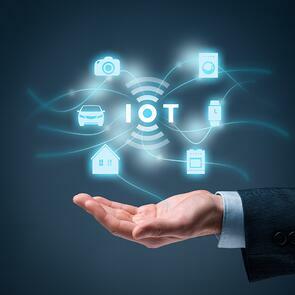 How Should Infrastructure Asset Management Prepare for the Internet of Things (IoT)? Many of the advancements that are currently underway in the joint use industry will impact the basic day-to-day operations for infrastructure asset management teams. Becoming aware of what these changes are and the effect they will have and planning for how to address them will be key to many businesses' future successes. The Internet of Things means more data. A lot more data. And along with all of this data comes the significant challenge of figuring out how to analyze, understand, store and use it. It will be too much for individual analysts or even teams to process, instead requiring advanced analytics or machine learning (i.e. the capacity for algorithms to analyze data in an iterative way, learning and adjusting based on the outcomes). However, figuring out a way to understand and use this vast ocean of data will open the doors to invaluable insights into customer engagement, asset management, energy efficiencies, industry trends and preferences, and much more. Data-driven decision making will minimize risk and pave the way for significant future growth opportunities. As the quantity of data multiplies, the focus on security will become increasingly pronounced. Comprehensive security strategies and structures will need to be in place to prevent cyberattacks that can take control of a utility grid and cause the complete breakdown of technology and services. Similarly, privacy policies regarding customers’ personal data need to prevent unwanted sharing to third parties or in public. Strategic discussions addressing these issues should be part of every IoT plan. As the Internet of Things introduces new devices and technologies to infrastructure asset management, employees will need the skills to use them. These changes will influence both recruiting and training needs. The next generation of joint use staff will need the capabilities to maximize the sophisticated monitoring, control, and analytical systems—from linemen to data analysts. Learn more about what we expect from the future of joint use—from increasing demands for improvements to infrastructure aesthetics to the potential for joint use as a revenue-generating business—by downloading our most recent eBook, Joint Use in the 21st Century.